Addiction is an illness that should not be fought alone. Information about its causes, which can aid in prevention, and the decisions that can lead to recovery are key weapons in the battle with addictive substances and behaviors. 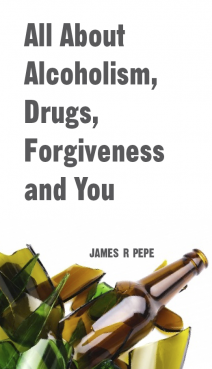 In this brief, readable and practical book, All About Alcoholism, Drugs, Forgiveness and You, James Pepe offers his help, sharing his insights about the causes of addiction, the role of genetics, the physical complications, the value of spirituality and the crucial need to increase awareness among our children. He helps remove the shame attached to this illness, encouraging the afflicted to forgive themselves as they seek to reclaim their sobriety. Those most qualified to offer advice speak from personal experience. James Pepe’s knowledge of his subject, and the goal of this book, are based on several decades as an A.A. member and sponsor. Whether you are dealing with a personal addiction, or searching for truth and advice to help family or friends, All About Alcoholism, Drugs, Forgiveness and You will help you understand this disease and how best to avoid it, or to get started on the path to recovery and living responsibly. James Pepe is a World War II veteran who won a Bronze Star Medal as a Navy corpsman attending the wounded. An A.A. member since the 1960’s, he has been active as an A.A. sponsor for forty-seven years. He lives in Boca Raton, Florida.